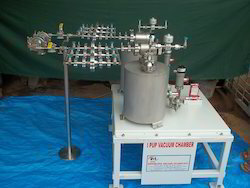 We have set up ourselves as an eminent maker, merchant and supplier of Vacuum Chamber. Our offered vacuum chambers are tried on various parameters under the heading of our quality specialists keeping in mind the end goal to convey a perfect reach. vacuume chmaber using for twin screw extruder machine. We are the manufacture of Vaccum Chamber for Electronic Potting Applications and it can also be used Degasser. We are engaged in offering Vacuum Chambers that are manufactured using quality raw material such as stainless steel (chamber material). These steel vacuum chambers and others are customized as per the specifications of our clients and have been appreciated for excellent capacities and other features. Our organization is engaged in offering a vast gamut of LTV Vacuum Reservoir. to our clients spanning across the world. These vacuum reservoirs are tested by our quality controllers on various well defined parameters in order to ensure flawlessness. VERYCLEAN MANUFACTURES DREGASSING CHAMBER WITH VACUUM PUMP, RELIFE VALVE AND HEATING TO REMOVE GASES FROM HYDRAULIC OIL AND ATF. SYSTEM IS READY TO USE WITH 2 YEAR GUARANTEE, SPARES AND OERATION MANUAL. We offer Vacuum Chambers that are used for casting and curing of propellant that are used at various space vehicles. The size of these chambers is 3200 dia x 9 mts long of 15 Tons in weight. The vessel of these chambers is designed as per ASME Sec.VIII div.I. 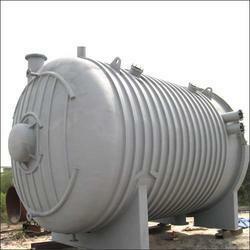 (Boiler and Pressure Vessel Code) with stringent quality standards. Our range of Vacuum Chambers, Systems & Components is used in several applications. We are offering various models of these products to suit the requirements of our clients.